Reserve Model engine choice for the Coupe Des Barons Competition. I face a bit of a dilemna and your assistance is eagerly sort. I'd go with 8oz myself. 52 Surpass, roughly equals a good .45 on standard silencer, or, a piped 40. It'd be the smart I.C. choice I think. Prop, 10x8 (yes, really) on the pylon race, and 13x4 for the other stuff. Put the largest one in that will fit, after all, you don’t have to fill it with fuel. I doubt a J60 will notice a few extra oz so go large! For props 10x8 may not offer the thrust needed to overcome the drag of the J60 so might be slower than 11x7. You would have to test. 13x5 works well on os52's if you dont need speed. It's not for a j60 jon. But a good point, try a few different props if possible. No but they are about the same size and there's nothing in the rules about not being able to change the props . I'm working on the wing now. Upright or side mounted engine? ah, i missed a page then! Ah, but, the J60 has a big thick undercambered wing section with drag like a parachute. And them big round thick tips, also not exactly a low drag solution. Whereas, your Baron, he has a thin(ish) Clark Y, and the swept back tips are a bit better. As for the question, upright, side, I'd say side mounted is marginally better as the sticking out bits (cylinder head) will line up with another big sticking out bit (wing). Bit of a junior school level guess, mind. SAM 35 spec is for 35 two stroke plain bearing engines so the hot rod 35 ballraced schnuerle engines are not permitted. There was also a spec for electrics in which I have no interest and I can't remember what it was, knowing sam 35 it'll probably be for brushed motors and nicads to level the playing field. I've got a s/h os 35 fp coming but it's probably a waste of money as my recollection of J60s is more power = rapid height gain and no increase in forward velocity, it'll probably have to fly with full down elevator. FWIW I built several svenson viscomptes and thought they were overpowered with an irvine 20 diesel converted to glow, christ a 52 4 stroke in same is mind boggling. In the group picture which I posted at 10.00 this morning, the winner is standing at the extreme right with the model finished in inter-war American training colours. He used an OS AX 35 with an aftermarket exhaust. Heaven knows what fuel he was using, the rules allow up to 50% nitro, but the model went vertical! Bet he uses incidence changing for the pylon bit. Saves a lot of drag by removing the down trim. 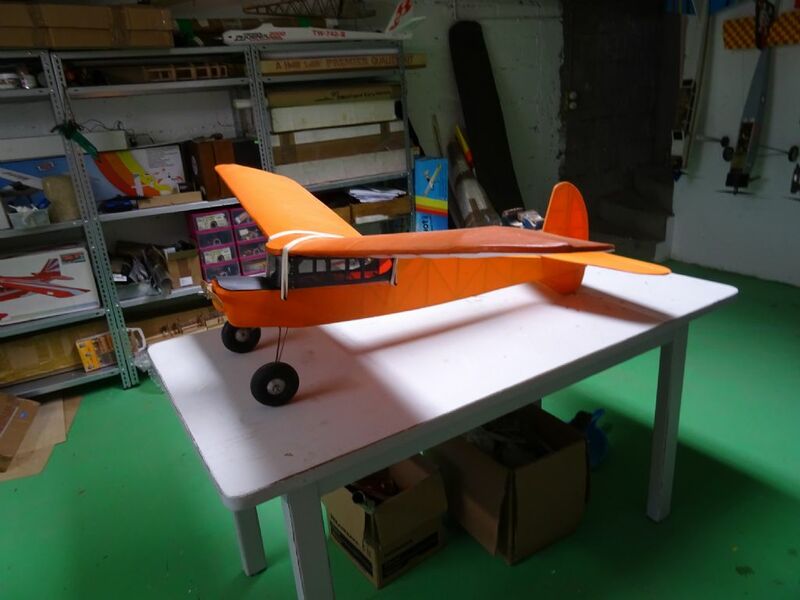 Looking at the video, the main issue is keeping the model flyable. To that end the model needs to be clearly seen, able to differentiate which way up it is. The biggest factor seems to be pilot depth perception. I am also suggest a model with a reasonable speed range. Being flat out only matters in the pylon race, and perhaps chasing the combat ribbon. Although in all good solid handling characteristics matter, particularly where Limbo is concerned. As for motor or engine. Electric power just does not have the duration, with slowly dwindling power. IC the power is there until the last drop of fuel. With IC it has to be relaiable running, at all speeds. The tank installation needs not to be sensitive to the models orientation or if the flight is starting or ending. It seems that the event is a war of attrition, and keep of the vino, until you are finished. First rate advice as usual Erfolg! To find out how much flight time I will have, I intend to put the engine on the test stand and run it flat out on a 6oz tank while timing the engine run. Would there be any merit in shortening the nose bearing in mind that the engine is heavier than the 3.5cc two stroke which the model was originally designed for? It's not a lot David, the Wot4 does variable firewall positions for engine weights 30 size to 60 size. Perhaps someone has the exact numbers, but from memory it was about 20 mm. You can work it out using your existing Baron. Weight of existing engine multiplied by the distance of the apx. mass centre of the engine to the centre of gravity equals weight of new engine multiplied by the new distance between its apx. mass centre and the centre of gravity. Which works out as old engine weight * distance from C/G divided by new engine weight gives you where to put the new engine. Or as Erf says, life is short. What I would do I'd make sure you can build a hatch in the aft fuselage areas, so the battery can be moved back.. or as a bodge, if the existing battery is already at the back of the wing Bay, chop 15 mm off the nose. I might chop anyway, because a 4 stroke sits further forward of from the firewall. Have you built the thing yet? If not, shorten the nose by a 3/4". Otherwise, hatch, battery at back. Your real job for this coupe des barons is not to dilly dally about the models, but to go out and fly 100 flights of nothing but limbos. Another 100 of knocking over foam sticks. You get the idea. On a side note, it applies to all sorts. I have been to a lot of bike races and triathlons. The entry lists are full of boys and girls of all ages who have spent hundreds and hundreds and most usually multiple thousands of pounds on fancy dandy bikes with super aerodynamic disc wheels and special clothes and super fast shoes and slippery swimming suits and all sorts of mystical dietary hoo hah rubbish. They are always beaten by the ones who spend little money at all, but do spend all their time riding a bike very fast. The most amusing time had a rather rapid lad turn up on a shopping bike wearing a top hat. Thing was, point made, he practiced a lot, and thus won. With his 3 speed shopping bike and silly hat. Lot of unhappy campers, that day. Man's right, an amateur practices until he gets it right. A pro until he can't get it wrong. The harder I work, the luckier I get. If I'm nervous before we start, what do ththis lot feel knowing I'm here. Wise advice from many quarters. To summarise the existing situation: I already have one Baron which I have called Boris because he is finished in spoof Russian WW1 colours. I do not usually give my models names or genders but I've made an exception in this case. 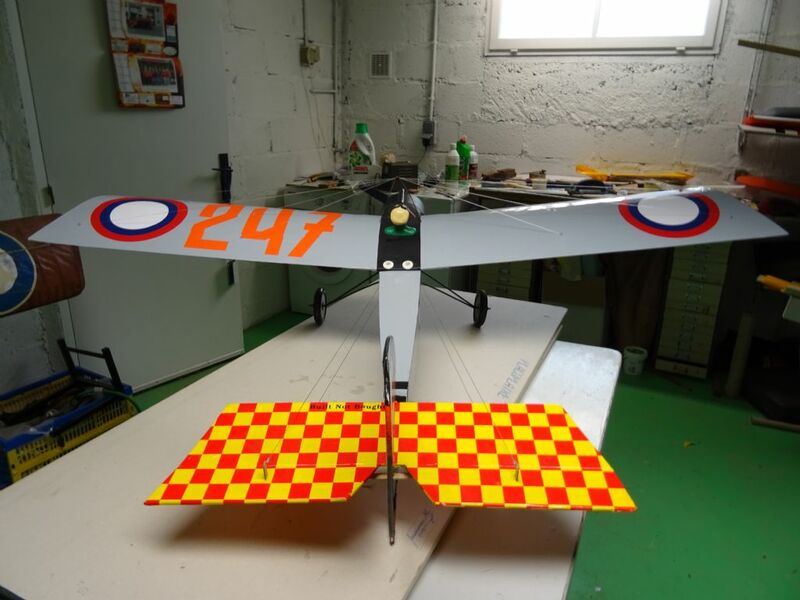 He was built from a standard Baron kit which is over-engineered in my view with too many wing spars and 6mm plywood forward fuselage. This produces an unnecessarily heavy model so with the Reserve Model I'm going to make something lighter. Boris is currently fitted with an SC 32 two-stroke but I'm thinking about replacing it with a Magnum 52 for this year's competition. That said Boris has had so many different engines installed, even an electric motor, that the firewall looks like a piece of Swiss Cheese! I will be fitting an OS 52 Surpass to the Reserve Model. I was tempted to fit an HP VT 49 but those engines are extremely heavy and not very powerful. You can get a few extra points if you use a period engine mind! The tailsurfaces have already been built and covered and the wing construction is well advanced. The Reserve Model's wing is based on a Super 60's three-spar and sheeted leading edge construction but with the Baron's thinner wing section. Full depth dihedral braces will be used.It should be strong enough. I need to build a new fuselage for it and will probably knock about 20mm off the nose. 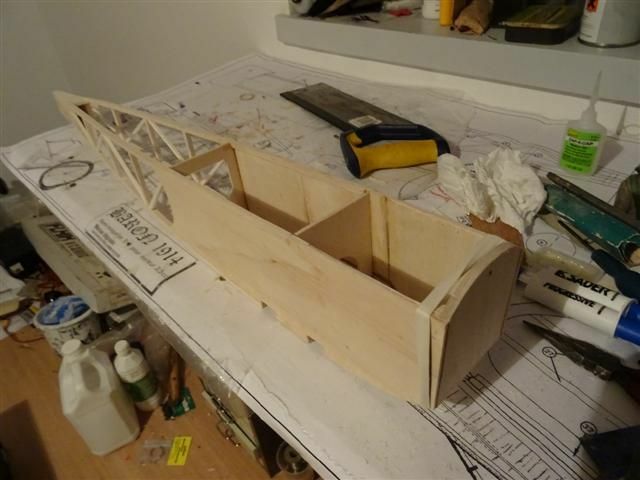 I shall be using basswood for the longerons and 1/4" balsa for the nose sheeting where the kit uses thick plywood. 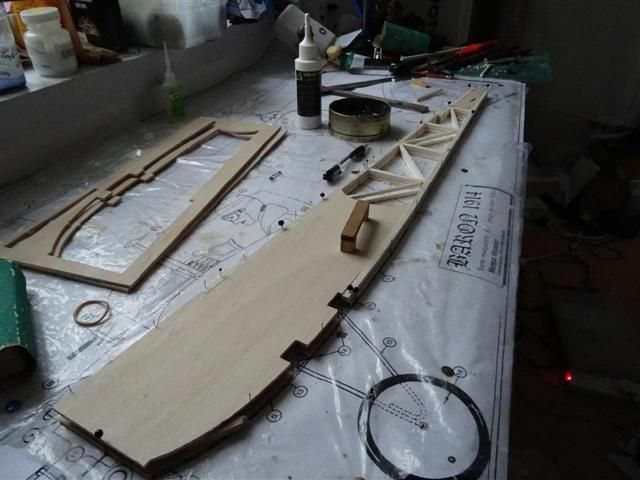 Pictures of Boris's kit-built wing and fuselage below. 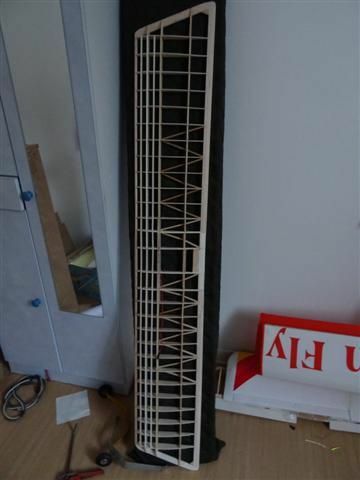 Do you think that I should reinforce the nose area with thin plywood doublers on the Reserve Model? As for constant practice, that's why I'm building two Barons. If I damage one in practice, I still have another one to fly. The Reserve Model will be finished in inter-war RAF colours and it will be called Bertie! If the front half is all 1/4" sheet I'd not bother with doublers. Jam some 3/8" triangular - or similar - in the corners between firewall and sides, job done. It is not only about practice, it is at distance, as the flight line seems to be in the next country. Robust is about all those things we aspire to, light yet strong. Titanium comes to mind, what you do not have any? Perhaps good quality ply, FG, all used in the right places. Particularly the wing. The type of construction that allows gaffer tape, cyno etc to used as you go along. Built in redundancy of structure, so that the first bit of damage does not eliminate. Above all, a willingness to accept that your models may be a lot smaller when going home, that the bin bag was not a waste of time carrying in the boot. All Forum Topics > Chit-chat > Reserve Model engine choice for the Coupe Des Barons Competition.